This was the best lunch of the whole trip! For lunch today we had almonds, dried banana chips, and dried apricots. 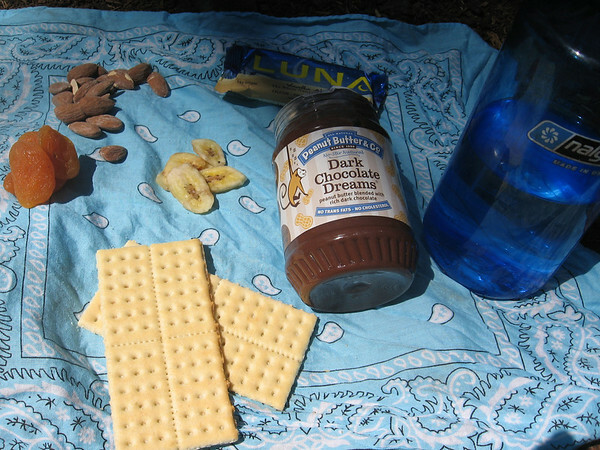 We also had crackers with a peanut butter chocolate spread, granola bars, and lots of water. The almonds tasted good in the peanut butter chocolate spread. We needed calories because we have a long hike ahead of us today! It is still so strange to us how much water we drink when we are hiking. Some of us think we will try to drink a lot more water when we get home. 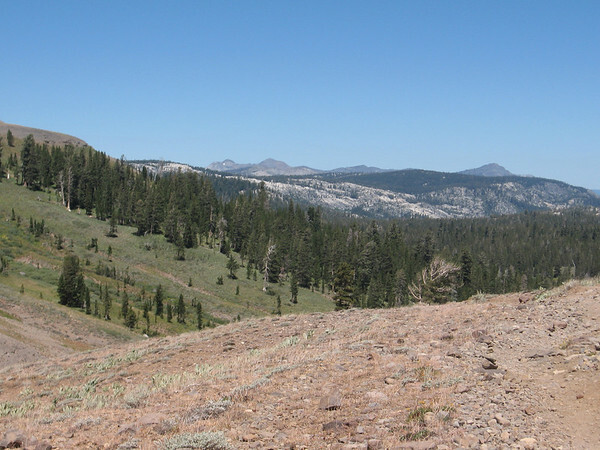 Today's view is the trail between Dardanelles and the Big Meadow trailhead, which is the end of our trip! There isn't a lot to see and we are sort of sad the trip is almost over and sort of happy because we are a little tired. We all agree that we could go a couple more days, though! Today's song is On My Honor, which is a US Girl Scout song. It makes us a little sad to sing it because we sing it on the last night of camp every year and it always makes everyone cry, especially our leaders. We wish camp wouldn't end but we know we'll stay friends even when we're not at camp. We all want to come back next year to be Rovers, who go out on a 4-day backpacking trip! Some of us want to be Superpackers already, but they go out for 12 days and that seems like it would be really hard, but we are having so much fun that maybe it wouldn't be so bad! 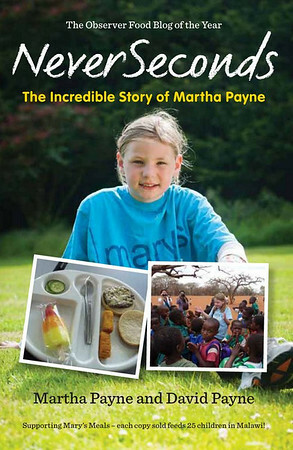 Today we want to challenge all Girl Scouts to donate to Mary's Meals! This is the 100th anniversary of Girl Scouts in the US, and we should all be grateful for the opportunities Girl Scouting and especially Girl Scout camp has given us. We are writing to the Girl Guides in Malawi and we hope they get to have as much fun as we do here! Camp director FIREFLY here...on behalf of Two Sentinels Camp, all our volunteers, and the Girl Scouts of Northern California, we all want to thank VEG and her NeverSeconds blog for the terrific opportunity for our girls to take part in this global conversation. Thinking about the food they eat and the kids, especially the girls, helped by Mary's Meals has been a life-changing experience for our WANDERERS...thank you, so very much. I've very much enjoyed this week's lunches! I went to this same camp when I was younger, about twenty years ago now! No way!! I'm sure we have staff at camp who were there with you as a child! PLEASE email me so we may add you to our alumnae list. We marked our 75th anniversary last year amid much hooplah and celebrating with past campers and staff, and we plan to continue celebrating milestones with our beloved alumnae... twosentinels@yahoo.com. I am moved to tears by the love shown on this blog an example of which is the thanks written on behalf of the Girl Scouts of Northern California. Through the discussion of food VEG has created something special that invites the whole world to speak. To see girls connecting with each other like this can only lead to consequences that are good. Camp Director Firefly's husband here... There is nothing so gratifying as being a dad at camp, except perhaps when the girls happen upon an especially brilliant (to borrow the particularly apt British usage) opportunity to go global with their passion. I echo Firefly's gratitude for this opportunity from Veg and her dad, and encourage everyone to join us in support of Mary's Meals kitchen in Malawi! Many thanks, girls (and Firefly!) for your week of guest blogs. You've reminded this old Girl Scout of some very happy, very long ago memories, and I'm thrilled to know that the tradition lives on. Thank you for the great posts! It was a wonderful journey travelling with you and enjoying the sights! The only thing I regret about moving to the city is how much I miss just walking into the woods and communing with nature whenever I wanted. This week really made me remember some awesome hikes and my time spent at my 4H camp. I'm so glad you all had an amazing trip (and it looks like you had excellent weather for it)!